Moving to a purpose-built GP teaching clinic in regional Victoria has brought career growth and lifestyle rewards for United Kingdom-trained doctor Robert Campbell and his peers. Empty nesters Robert and his GP wife Dr Elizabeth Kennedy embraced the unique opportunity to move Down Under in 2013 to practice and become GP supervisors alongside their medical school friends at the innovative University of Melbourne Shepparton Medical Centre. Their UK friends ̶ doctors Derek Wooff and Jane Gall ̶ had taken up posts at the teaching clinic when it opened in 2010, and enthused Robert and Elizabeth to join them on their supervision journeys. The University of Melbourne Shepparton Medical Centre was the first purpose-built teaching clinic in Australia, designed to provide primary (GP) and secondary (specialist) medical and allied health ambulatory care in a parallel consulting model for medical and allied health students. 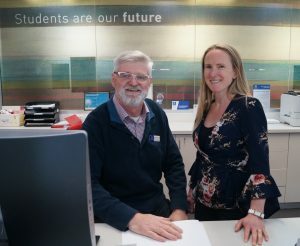 GP supervision is a rewarding journey says Shepparton Medical Centre medical director Robert Campbell, pictured with the purpose-built teaching clinic’s operations manager Joanne Kinder. The clinic’s large student learning hub doubles as the practice tearoom, meaning registrars and medical students have constant access to peers, GPs, practice nurses, and visiting specialists in their collaborative learning environment. It’s clear from the outset, this is a contemporary and vibrant medical clinic providing best-practice patient care and an all-inclusive, proactive learning space for young, and senior doctors alike. “The attraction to come out from the UK was teaching,” Robert, the clinic’s medical director, said. As a full-time GP in the UK, Robert had enjoyed some limited teaching experience in public health, as well as at Scotland’s Dundee and St Andrews universities, but has honed his skills as an experienced supervisor in Shepparton. The modern, light-filled clinic is on the University of Melbourne Department of Rural Health Shepparton campus, opposite the Goulburn Valley Base Hospital, and is a collaborative teaching environment which has also attracted other overseas and interstate doctors. “The University of Melbourne embed a core of students here in Shepparton who do the bulk of their learning in a general practice setting, which is quite unusual,” Robert said. Robert said the eight-year-old clinic had a proud culture of vertical integrated learning which involved everyone from administration staff through to visiting specialists. “All four senior doctors are approved GP supervisors; but even within that structure, we involve GP registrars in supervising or helping peer support for their juniors. “We are all involved with the undergraduate teaching we do with the University of Melbourne. That is, all the medical staff, whether they are GP registrars or fully fellowed. Robert and his colleagues hope this teaching ethos will in turn be paid forward by registrars and medical students throughout their careers. He said registrars enjoyed the clinic’s vertical integrated learning structure, and giving these learners the opportunity to also teach others was ideal exam preparation. “It’s really good revision for the GP registrars getting near exam times because they are having to think about what they are doing. 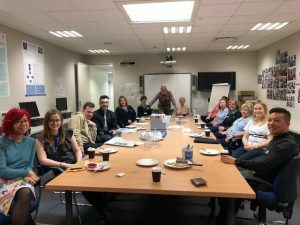 Robert said “wholistic wrap-around medicine” and teaching registrars how to work in partnership with patients was another element of the Shepparton Medical Centre’s teaching ethos. “In teaching wholistic wrap-around medicine, it means we are not just interested in the symptoms put in front of us: you might come in for a prescription, or a referral, or because you have got a pain; but we are interested in who you are, who is at home with you, what’s your social background, what’s your academic attainment, at what level in terms of your health literacy do we need to pitch what we are doing for you and with you? “It’s very much a partnership, and I think that’s what the patients here appreciate. Shepparton Medical Centre’s student hub doubles as a tearoom, and with an all-practice morning tea break, provides learners with continuous interaction with professional mentors. “The partnership is not just telling them what to do: it’s trying to help the patient understand what they need to do to optimise their health, minimise illness, and come to terms with things for which there is no cure; and that can be the hardest part. With regular visits to their family in the UK, Robert and Elizabeth remain committed to their GP supervising journey in Shepparton. Centrally located, two hours’ drive from Melbourne and close to wine, river, high and snow countries, Robert said the multicultural region was suited to any GP’s lifestyle. “The area is suited to families, couples, sports enthusiasts and lovers of food, wine and art,” he said. Currently seeking a GP supervisor (new or experienced) to join the clinic, practice operations manager Joanne Kinder echoed Robert’s enthusiasm for regional living. “Shepparton is a thriving and vibrant region that is experiencing significant change and growth, in particular with recent budget announcements; we believe it is an attractive place to set up your family and embed yourself in the community,” Joanne said.